A fresh start … a blossoming relationship … a haunted house. Melanie Robertson-King’s latest novel has all the earmarks of suspense and steamy romance. It starts with a bang and is filled with supernatural and scary events that create tension in the novel and lead to the final unraveling of the secret of Hillcrest House. 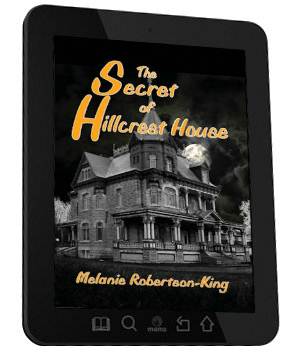 The Secret of Hillcrest House is the first book from Melanie Robertson-King I have read. When I read the blurb for the book I was very excited as I love a good haunted house mystery! From the outset, the action starts when we are introduced to Jessica who has just bought Hillcrest House. The sale of the house is slightly unusual in that Jessica buys it from the internet without ever having viewed the house before. This is a decision she soon regrets and her planned move into the house is not going according to plan. There’s just too much to fix! Her first visit to the house sees her get the fright of her life when she sees a face at the window. However, hunky cop Alain is on hand to help a damsel in distress. Jessica, not long out of an unhappy and grief-stricken marriage is instantly attracted to Alain who himself has suffered grief at the loss of his wife. The story moves on at quite a rapid pace and I was able to read the book, which is only about 168 pages, in one sitting. It was perfect for a rainy and dismal Sunday. There was lots of mystery throughout and the ghosts of the past were ever present in Hillcrest House. Jessica is determined to find out what secrets Hillcrest holds and restore it to its former glory but she seems thwarted at every turn. You can read the entire review at Brook Cottage Books. Jessica didn’t really know why she had decided to buy Hillcrest House in Eastern Canada, sight unseen, except for the fact it looked just like a house she had sketched many times over. However, on actually seeing inside her new purchase, the work that needed to be done was somewhat of a shock. The physical and financial shock would actually become less shocking in comparison with the number of ex-residents who still appeared to be still living in the house, years after their own deaths. There were secrets to be uncovered that would bring back some of her own most painful memories that preceded the ending of her last relationship. Even the garden wildlife was odd…one specific crow with a white feather really managed to get Jessica’s attention. Jessica’s attention was also taken by a good looking, in fact very hot, police officer with his own complicated history. 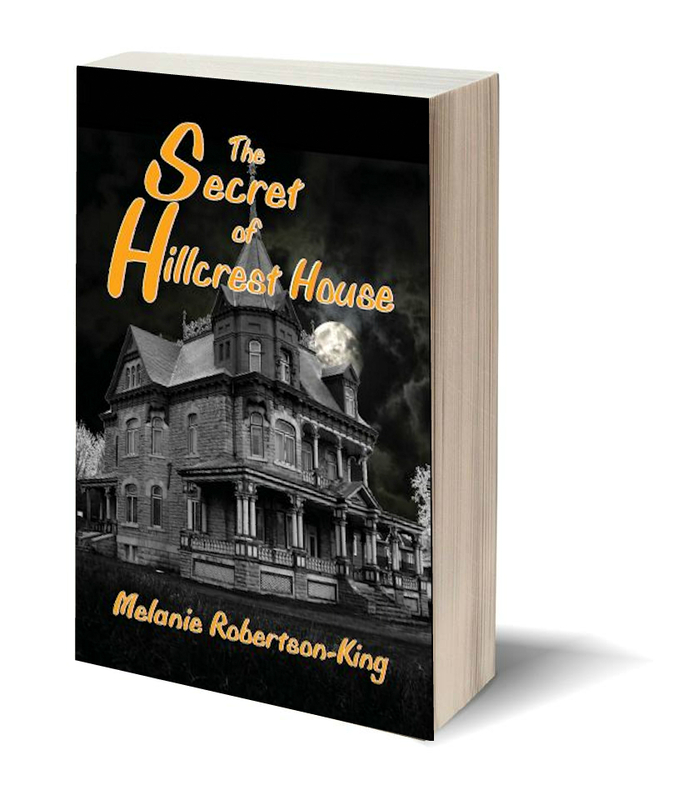 Their attraction was magnetic and together they worked to unravel the secrets that Hillcrest House was hiding. The full review can be found at A Chance to Blog. While I’m not usually a reader of romantic suspense stories, I did find this a very easy read. Short and succint, I started and finished it within a few hours. The Secret of Hillcrest House had me thinking of Hallmark movies, I could quite easily see this story on screen. The entire review can be found at Fiction Dreams. You can read Sheryl’s review in its entirety at Goodreads. I jumped at the chance to read this, as I love a good ghost story. And this is a Ghost story with a difference, a spice of romance I couldn’t turn the pages fast enough…..I loved it. In this story we meet Jessica Maitland new owner of Hillcrest house with strange visions appearing in the window of the second floor stranger things happen inside the walls! Non of the owners stay long but will Jessica be able to unravel the dark secret that lies within the house? You canread the rest of this 4.5 star review at Chelle’s Book Reviews. Jessica Maitland, looking to reboot her life after the death of her baby, and the end of her marriage, bought the old Hillcrest House in Angel Falls via the internet, discovering when she arrived to take possession that it wasn’t quite what the real estate website indicated. As she set about making her new home livable, strange, and sometimes frightening things happened. When the house was livable and presentable, more unusual and alarming happenings interrupted a housewarming party. She started piecing the history of the house together, hoping to find some answers. She learned the Hargrave family had lived in the house in the 1880s. Many locals believed the Hargraves never left the house, and it was they who chased away numerous new owners over the years. Undeterred, Jessica, who had fallen in love with the house, including those who resided there with her – and a local constable – stayed. Then, one day, she discovered the true Secret of Hillcrest House. This book is really a fun read. It keeps you guessing about the big secret, right up to the last minute. I would definitely read this book again, and I’d recommend it to friends, and anyone else who enjoys a nice mystery/romance story. I give this book 5-stars. (I was provided with a free copy in exchange for an honest review.) A fun read that keeps you guessing right up to the surprise ending, Dayna Leigh Cheser, Author of Janelle’s Time, Moria’s Time, Adelle’s Time, & Logan’s Time. Although I have to confess to being a romance girl I’m always keen to step out of my comfort zone on occasions and this was one of them. I was drawn into this book from the first page. Jessica Maitland has sunk her savings into Hillcrest House in the small town of Angel Falls. It was too much coincidence that she’d been doodling the exact same house on pads and paper for some time; she had to have it. Having made the purchase without actually looking over the place, she’s shocked to find it in a very dilapidated state. As soon as she steps through the doors things begin to happen. Fuses blow, doors that appear locked are suddenly open, there are apparitions and children’s laughter. And then there are the crows. You can read the full review at Goodreads. I was offered this book to review and I nearly passed on it because I have so many already on my TBR (to be read) pile but the picture on the cover crawled under my skin and I have to say from the first paragraph I was lured in and totally captivated. Jessica spots an ancient Victorian mansion for sale online and buys it unseen, the house spoke to her and she was of the opinion that she could renovate the dilapidated building and return it to it’s former glory. However once she begins it becomes apparent there is way more to do than she ever imagined, this house could descend into a money pit just to get it habitable. Unfortunately for Jessica that isn’t her only problem. Weird events begin to occur, she sees apparitions, the atmosphere chills, unexplainable odours stench the building out and the crows arrive. I have to say the crow was one of the eeriest parts of the story for me and so well orchestrated. Read more of this review at Ali the Dragon Slayer. I really enjoyed this book with its strong heroine, Jessica and gorgeous law enforcer hero, Andre Alain. When Jessica buys the rundown Victorian House she doesn’t expect to be dealing with anything more than a bit of renovation. Has she got the guts and determination to see this project through to the end, or will she decide that dealing with the secrets encased in this once beautiful home is too much of a challenge for her? Do you like to wander through old, abandoned houses, hoping maybe to spot a ghost? Do you wonder what happened to the family or families that once lived there? Do you enjoy discovering secrets? If you answered yes to any of these questions, then you’ll want to read THE SECRET OF HILLCREST HOUSE, by Author Melanie Robertson-King. And I forgot to mention there’s a pretty hot romance, with some graphic scenes, as well. From the very first pages of the story, the author gives us a mystery to solve when Jessica Maitland sees someone on the porch of the old house she just bought. It’s supposed to be empty, and has been for a long time, but rumors do say the house is haunted. Has Jessica seen a ghost or is it only her imagination? You can read the rest of Beverly’s review here.